All-on-4 dental implants have a number of benefits over conventional dentures, and one of these advantages is the strength of the appliance. Because dental implants function similarly to biological tooth roots, the appliance can withstand significant chewing forces. 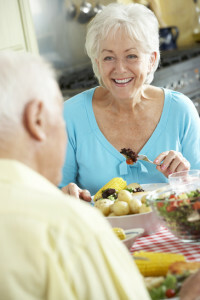 As such, All-on-4 patients often find that they can continue to enjoy most, if not all, of their favorite foods, even with a denture. Dental implants are unique among tooth replacement devices because they provide a structural substitute under the gum line in addition to filling in for the visible crown portion of the tooth. After a periodontist inserts dental implants into the jaw, the titanium implant becomes a permanent part of the mouth’s structure after osseointegration – the growth of the surrounding bone around the implant – is complete. Although just four dental implants are used to support the appliance, All-on-4 is still a sturdy treatment option. The outer two dental implants are angled beneath the gum line so that they can provide better support to the rear portion of the denture. Of course, to get all these benefits after the periodontist places your dental implants, you must take good care of your oral health to prevent a relapse of the condition that caused your initial tooth loss. Make sure that you are following an oral hygiene regimen recommended by a dental professional and following up with a dentist at least every six months for routine exams and dental cleanings. Furthermore, anything that can damage biological teeth can damage your appliance as well. So, to preserve the integrity of the implant-supported denture, don’t chew on non-food items like pencils or fingernails. Ask your provider if there are any specific foods you should avoid as well. All-on-4 dental implants offer a lifelike tooth replacement option that approximates the strength of biological teeth. Patients who want a durable solution to replace an entire arch of missing teeth or even an entire smile can consider this alternative to conventional dentures. Contact PerioNYC to schedule an initial consultation and learn more about All-on-4. Will I inevitably lose my teeth as I get older? What is the All-on-4 Dental Implant Technique? This entry was posted in All, All-on-4, Blogs, Dental Implants, Missing Tooth (Teeth). Bookmark the permalink.